According to myth, the camel was created by Lord Shiva at the behest of his consort Parvati. Parvati shaped a strange five-legged animal from clay and asked Shiva to blow life into it. At first Shiva refused,saying that the misshapen animal will not fare well in the world, but later gave in. He folded the animal’s fifth leg over its back giving it a hump, and commanded it to get up, “uth”. That is how the animal got its name.The camel then needed someone to look after it, so Shiva rolled off a bit of skin and dust from his arm and made out of this the first Raika. Historically, the Raika of Rajasthan have had a unique and enduring relationship with camels. Their entire existence revolves around looking after the needs of these animals which, in turn, provide them with sustenance, wealth and companionship. 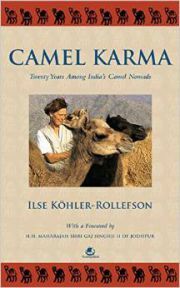 When German veterinarian, Ilse Köhler-Rollefson, arrives in Rajasthan in 1991, she is Immediately enthralled by the Raikas’ intimate relationship with their animals but also confronted with their existential problems.This is the story of the quest that follows to save a globally unique and humane animal culture and find a place for the camel in rapidly changing India.It is a journey that is often exasperating, sometimes funny, but keeps revealing unexpected layers of rural Rajasthani mores. A travelogue of a sort, this book takes us deeply into the diverse cultures that make Rajasthan such a fascinating place. "ILSE KÖHLER-ROLLEFSON has worked and lived in Rajasthan, India since 1991. She fell in love with camels more than twenty-five years ago, and has dedicated most of her professional life, as a veterinarian, anthropologist and activist to this species. In 2002, she was awarded a Rolex Associate Award for Enterprise for her efforts of “Saving the Camel and Raika Heritage,” in 2009 she received the Trophée de Femmes of the Yves Rocher Environmental Foundation, and in 2014 the Marwar Ratna Award. She is also founder of the League for Pastoral Peoples. Currently, she lives in Rajasthan researching and writing about pastoralists, animal cultures and sustainable livestock- keeping worldwide."